Where: Trapeze School New York. Trapeze School also has Boston, L.A., Chicago and Washington D.C. locations. What We Did: After being strapped into serious harness belts, we went over the basics. Ten toes over the edge of the platform, grab the bar (it'll be heavy), bend your knees, jump... and soar. Along with the nine other students in the class, I rotated through four trips up the creaky ladder, onto the platform and into the cool air. We learned how to swing our legs up onto the bar and release our hands, how to do a backflip dismount, and, toward the very end, a catch. For How Long: The class lasted for two hours. How'd It Feel: Two of the most important rules our instructor Travis stated at the very beginning of the class were not to judge yourself and to try to have as much fun as possible over the two hours that followed. Yes, there were also important safety rules, but starting out by choosing not to instill even more fear in my pounding heart went a long way for calming my nerves. Watching a couple of class participants take their turns before me, I waffled between sheer disbelief that I was really going to do this and moments of confidence that I'd nail it. But by the time I had landed safely in the net after my first run I had discovered that climbing the ladder up to the platform was the worst part. Thanks to those sturdy harnesses, the instructors were able to alleviate some of our body weight just by holding onto our safety ropes, leaving the bulk of the work on me to perform the motions rather than hold myself up on the bar -- honestly, it was much easier than it looks. All sorts of childhood monkey bar memories came flooding back as I flipped my legs through my arms and over the bar, letting go of my hands and soaring back the way I came. While tempting to hoot and holler with each swing, it took real concentration to focus on the instructor's commands while swinging upside down through the New York City skyline. There were a couple of times I missed my cues to drop from the bar, heart pounding in my ears. Trapeze requires the kind of attention to your body and surroundings that I tell myself I should be paying to my running. What It Helps With: There's certainly some coordination and flexibility involved, but this particular (very beginner) class wasn't designed to be as much of a workout as an experience. Certainly, the better and more comfortable you get, the more advanced movements you can do, calling on more muscle strength as you go. What Fitness Level Is Required: Anyone can try it. Some gymnastics, cheerleading, swimming or diving experience certainly can't hurt, but it's definitely not necessary. What It Costs: Classes range from $50-$70 depending on the day and time, and package deals are available. Would We Do It Again: Without a doubt. I think I understand why TSNY's trademarked slogan is "Forget fear. Worry about the addiction." 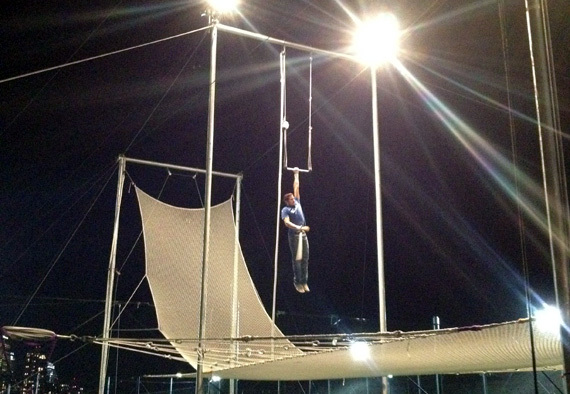 I can't say trapeze will be replacing many of my regular cardio or strength workouts, but I can't wait to fly again.